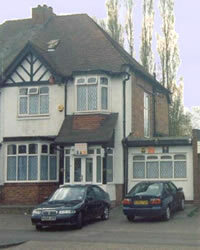 Birmingham Bed and Breakfast - Central Guest House Bed and Breakfast in Birmingham, England: Small family run guesthouse having 5 letting bedrooms, all ensuite rooms. 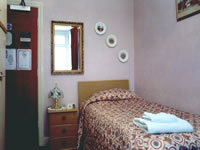 Small family run guesthouse having 5 letting bedrooms, all ensuite rooms. 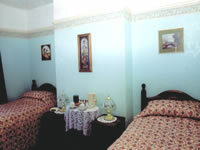 The establishment offers friendly attentive service and a hearty; freshly cooked breakfast full or vegetarian Bedrooms come in a variety of sizes; all are nicely decorated & well equipped. Situated on the main A/45 Coventry Road 4-miles into the Birmingham City Centre, New Street Station, 4-mile to Birmingham International Airport. International Railway Station, International Exhibition Centre. If the room(s) are not cancelled out within the cancellation policy, the full amount of money will be taken for the room(s) & day(s) booked. If the booking is made through an agency, you must cancel out the booking with them. If you do not cancel out the booking with the agency, you will be charged the full amount of money for the room(s) day(s) booked. A full or vegetarian breakfast is included in the price. 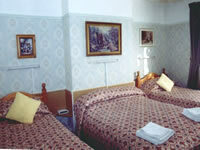 A ten-pound deposit per room is required to reserve the room(s) We do accept credit cards. To get to central guesthouse from Birmingham International Airport, International Railway Station, you can catch a black cab taxi just outside of the terminal, or catch the (900) bus they run on the half hour, ask the bus driver to tell you when you come to the Swan Centre, we are a short walk down the road. To get to the guesthouse by car junction (4 M6) junction (6 M42) heading for Birmingham International Airport, straight on overhead set of traffic lights Sheldon, Wheatsheaf Hotel straight on Wagon & Horses public house, up the hill level out Macdonald's, Shooting Star Pub & Restaurant, row of shops, Michael's Super Market, row of houses, clay lane pedestrian crossing, we are in the pull in on the left. Cadbury World, Drayton Manor Park & Zoo, The Old Black Country Museum, Warwick Castle, Stratford upon Avon.